-----You probably remember that I'm a geologist. Except for some few religious folks, there's probably no one who proselytizes more than a geologist. Worse, yet, a geology teacher. They're paid to spread the word. Look! A doubly recumbent plunging anticline! Wow! A low-angle thrust fault, with slickensides! Not only are we terrible at pushing our exciting revelations on innocent bystanders, but we're also unintelligible. 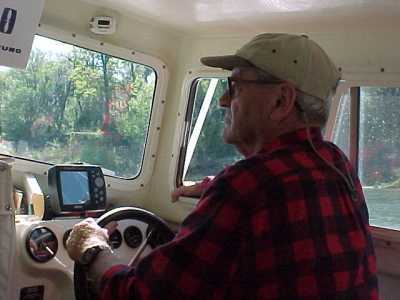 -----You'll just have to forgive me if, occasionally, a little geologic pontification slips into our writing about our boating experiences. -----So, with that disclaimer, I can now feel guiltless if I slip in a little geology. 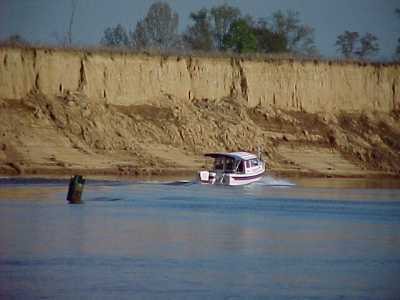 Cruising the rivers of the US, from New Jersey to Alabama, a little knowledge of the "deep past" might be interesting. -----Once upon a time, the edge of our continent lay well inland from what we know today. Right - no Tidewater Virginia, no Florida. Most of the area now occupied by Alabama, Georgia, the Carolinas, Delaware, Maryland and New Jersey was deep, deep ocean. Oh, and there were no Appalachian Mountains. Of course, no birds, mammals or even dinosaurs for that matter. We're talking about long ago - 300 million years ago, give or take a few tens of millions. -----I love the way geologists slop about the millions of years - sorta like astronomers describing the distance to a quasar or politicians kicking around the federal budget. Back in those good old days, the earth was an active place - still is, for that matter - but great geologic happenings were going on along the eastern margin of our North American continent. We were about to collide with Africa! -----You are all aware that continents slide around - somewhat haphazardly - rather like Summo wrestlers with too much sake. Well, back then, North America was calmly sliding northward after basking a few tens of millions of years in equatorial warmth. Africa and South America had just had a parting of the ways - they were one mass, Gondwanaland, for tens of millions of years. (I'm reminded of a bumper sticker, popular amongst geology grad students - "Reunite Gondwanaland.") Now, the divided remnants of that great continent were heading toward North America. -----When continents are in collision, there are titanic results. First, volcanoes roared to life along the then eastern coast of North America as though in fury over the impending collision. Then, as the masses struck, their margins crumpled from the impact. Mountains buckled skyward and for a short few tens of millions of years, the great ski resorts of our continent would have been in the Appalachians and not in the western Cordillera. North America and Africa were sutured together into a massive continent. -----Earth forces are fickle, and for reasons known only to Chaos Theory, Africa and North America eventually ripped apart, about the time the great dinosaurs were stalking about in the swampy interior of North America. The Atlantic Ocean filled the gradually widening rift between the continents. The rift is still widening and trans-Atlantic airfares will someday reflect this ever-increasing distance. -----But the great ripping and tearing of the joined continents was hundreds of miles to the east of the ancient suture zone where the continents were formerly stitched together. Thus, a great mass of African rock was left behind stuck to the eastern margin of North America - a calling card from an ancient visit. Most of the southeastern states have an African basement. -----Time marched inexorably onward. The dinosaurs thundered off the stage into oblivion. Furry mammals, safe from most reptilian giants, scurried and rustled through the underbrush. Birds, feathered dinosaurian leftovers, sang in the forests. The once-lofty Appalachians were slowly ground down by a million million storms. Today's mountains are the remnant roots of grandeur. -----The pulverized leftovers washed down the flooding rivers and buried the African basement rock with sand and mud. The thousands of feet of rock eroded off the summits became thousands of feet of detritus burying the margin of the continent. -----The basis for determining elevations anywhere on Earth is sea level. That is geologically dumb. Sea level is about as stable as the Dow Jones Industrial Average. Throughout time, and now we are talking about only thousands, not millions, of years, a graph of sea level looks like a yo-yo. During most of the past 75 million years or so, since Africa went walkabout from us, surf was lapping the base of the Appalachians. A huge salt water embayment flooded the interior of the continent as far north as Illinois. The milled remnants of the Appalachians lay as a great sediment wedge against the edge of their mountain source. -----So much for the geological story. What does this have to do with cruising in a boat, you are probably thinking? In the southeastern United States, it may stop your cruise. Go up any river in Alabama, Georgia, the Carolinas, or Virginia and you come to a dead end. 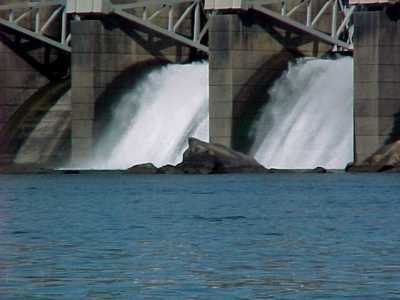 Only where the Corps of Engineers has temporarily overpowered the natural rock barrier with a dam can you continue upriver beyond the Fall Line. -----The muddy water you cruise on? Those suspended sediments are minute knives when fast-moving water slashes rock with those quartz grains. Thus rivers carve downward. The sedimentary wedge of ground-up mountains is soft and the rivers easily scour a channel. But, at the uphill limit of the wedge, there is solid bedrock. This is a challenge for those grainy knives. The rock resists, and the river tumbles over a falls of hard African rock. Every southeastern river is wonderfully navigable, often for hundreds of miles inland, until it reaches its geological nemesis - the Fall Line. 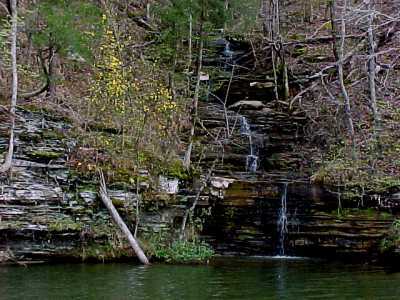 -----Early settlers of our continent built towns at the falls. Here they portaged the goods, brought down from the mountains by canoe or flatboat, around the falls and reloaded the produce onto riverboats or even transoceanic ships. Washington, DC, Richmond, Raleigh, Columbia (SC), Augusta, Macon, Columbus (GA), Montgomery, Tuscaloosa and numerous smaller towns that never grew to greatness lie on or near the Fall Line. -----If you cruise a southeastern river, think of its African roots. Notice the sand and mud of the banks and remember their source - a mountain range once as high as the Himalaya. And, at the dead end (or Corps dam), note the town or city at the site - the Fall Line - and the hard rocks, the calling card left behind by a departing Africa.